Finally, after some years of work, it has been accepted for publication in MNRAS. B[e] Supergiants are luminous evolved massive stars. The mass-loss during this phase creates a complex circumstellar environment with atomic, molecular, and dusty regions usually found in rings or disk-like structures. For a better comprehension of the mechanisms behind the formation of these rings, detailed knowledge about their structure and dynamics is essential. 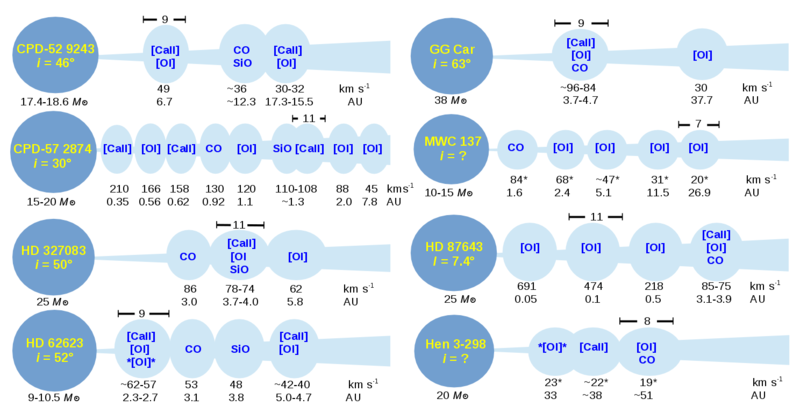 To address that, we obtained high-resolution optical and near-infrared spectra for 8 selected Galactic B[e] Supergiants, for which CO emission has been detected. Assuming Keplerian rotation for the disk, we combine the kinematics obtained from the CO bands in the near-IR with those obtained by fitting the forbidden emission [OI] λ5577, [OI] λλ6300,6363, and [CaII] λλ7291,7323 lines in the optical to probe the disk structure. We find that the emission originates from multiple ring structures around all B[e] Supergiants, with each one of them displaying a unique combination of rings regardless of whether the object is part of a binary system. The confirmed binaries display spectroscopic variations of their line intensities and profiles as well as photometric variability, whereas the ring structures around the single stars are stable. Figure 12 from the paper: A cartoon illustration of the disk-structures as derived from our analysis. We represent the [OI] λ5577 line as *[OI]*, the [OI] λλ6300, 6363 doublet as [OI], and the [CaII] λλ7291, 7323 as [CaII]. The arrows above the rings symbolize the typical ring-widths and are given in km/s. (For more details on the data used and references see Table 3. Note that the relative structures and sizes are not in scale. 45 mySQL queries in 0.468 seconds.